Do You Need a Tile Floor Scrubber ? A tile floor scrubber will try to remove any extra dirt that starts to accumulate on your tile flooring. As you probably know, a tile flooring type is actually pretty hard and so you’ll need a good scrubbing tool for you to actually be able to remove any of that dirt at all. The major problem with tile flooring is that between the tiles, not only dirt but also bacteria start to accumulate and pose a health hazard. It’s important to regularly clean the tiles and the zones in between the tiles with a good scrubber to remove those bacteria. Finding a good tile floor scrubber is not an easy task considering the wide variety of options that are in the market. These options aren’t usually too expensive and you can get an amazing piece of equipment for under $40, which seems to be very acceptable. But what should you be looking for when buying one? There are a few aspects that you need to consider: the way it cleans, how hard it is to remove the dirt and the bacteria. While the price is usually a factor, with models under $40 it’s something that we can ignore for a moment. Why is the handle such a big deal when using a floor scrubber? The fact is that without a big handle, it’ll be harder for you to reach all those difficult places. If it’s the flooring, you could always try a steam mop instead, but for walls, that easily becomes an unreliable option. Having to reach all the corner of your house with a short handle would absolutely kill your back. While the handle should be a rather big concern, it’s not the only point of focus: it’s also fundamental for you to get a model that actually cleans the place. With the ability of using the detergent that you want, it just becomes a lot easier to get the cleaning the way you want it to be. 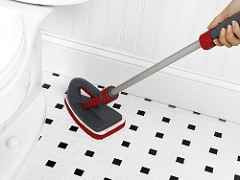 This is exactly what a good tile scrubber will get you: the possibility of cleaning the way you want to, reaching every corner of your tiles without causing severe back pain.